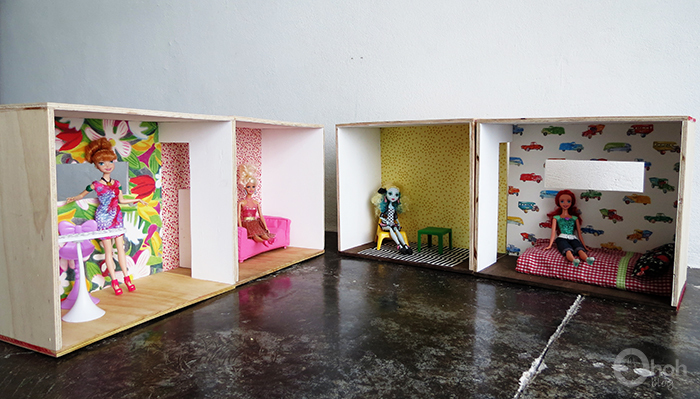 I wanted to make a barbie house for a long time. I don’t like the one you can find in the store too pink, too plastic and too expensive. After a few different ideas, I choose the simplest one. First because it was the easiest to make, but also because it’s the most versatile. Basically it’s just a few wooden box you can assemble the way you want. My kids love to play with it, they make a tower, a four bedroom villa or a condo…I may add some more boxes it the future. Let’s start with the tutorial. You will need 9mm plywood, 1 inch nails, wooden glue, a saw, a jigsaw, a hammer, a drill, some paint, and some nice papers. Trim a door in one of the side wall, the opening dimensions are 9cm x 29.5cm. 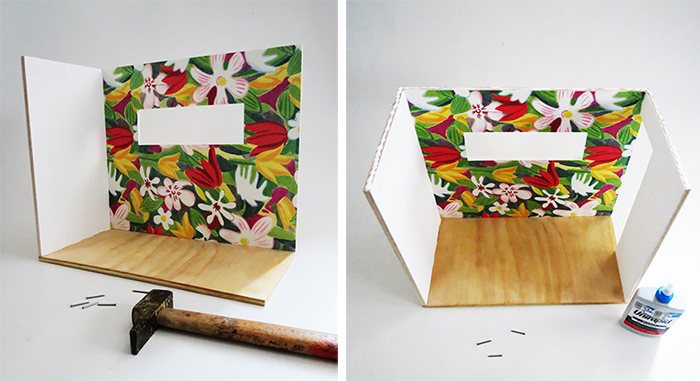 In some of the boxes you can make a window. You will need a drill and a jigsaw to do so. 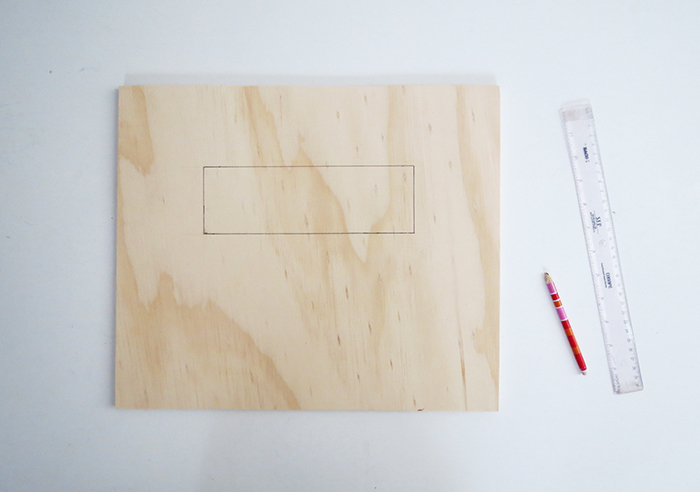 Draw a rectangle of 22cm x 7cm at 8 cm from the top. Be sure to center it on the wall. Drill four holes in each corner, I use a 1/4 drill bit. 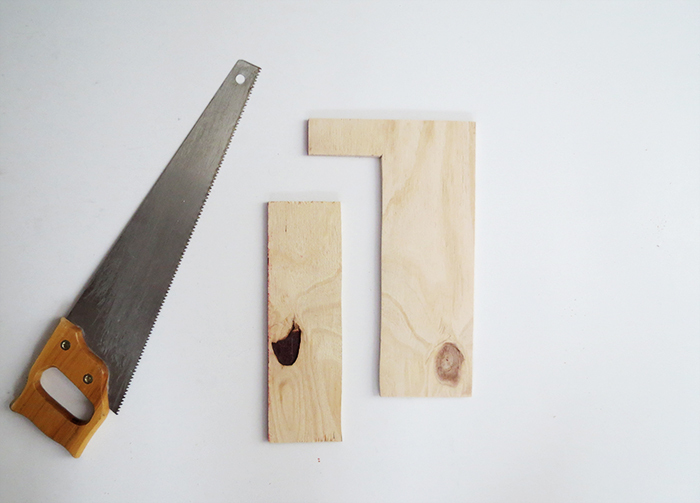 Once the holes are made you will be able to slip the jigsaw blade in it to cut the rectangle shape. Sand all the pieces, insist on the edges to have smooth finish surfaces. 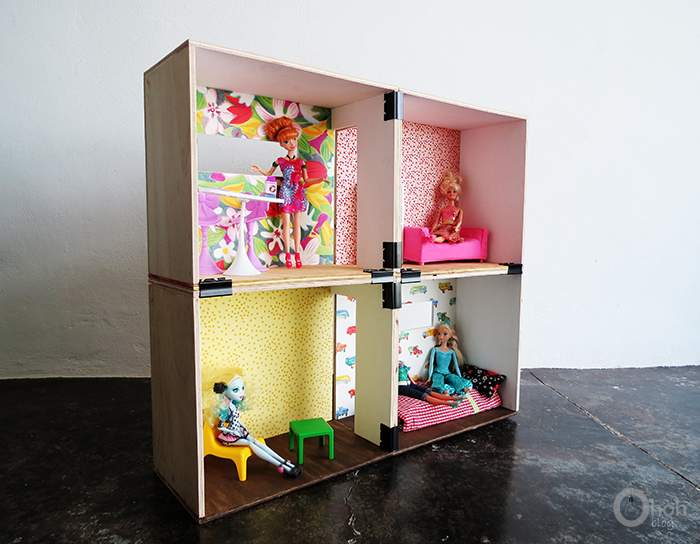 Choose the colors of the dollhouse. I stain the floor and paint the side walls and the roof in white. 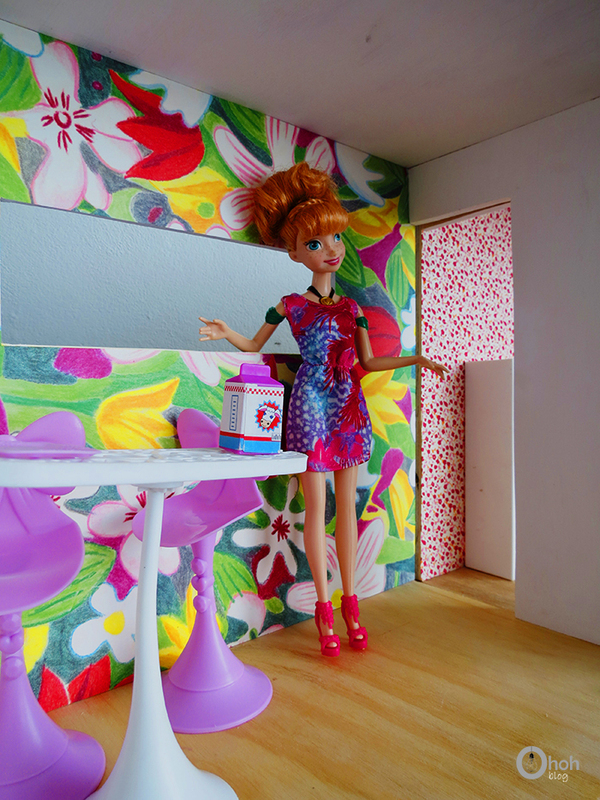 To add a little fun I apply a colored paper on the back wall. 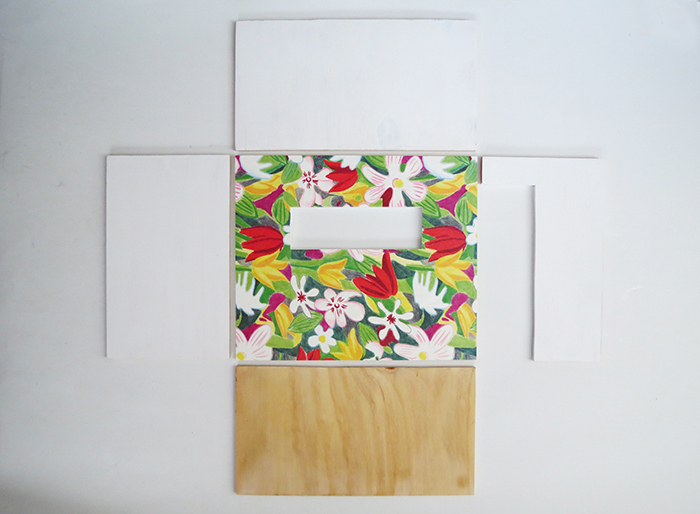 Once you are done with the wall decoration, you can start assembling the box. 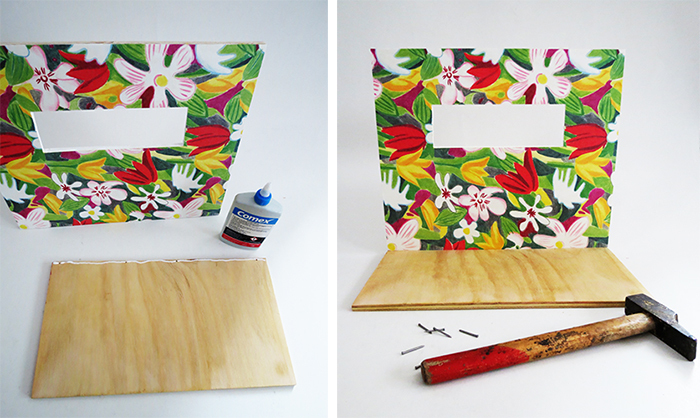 You need to glue and nail all the sides together. 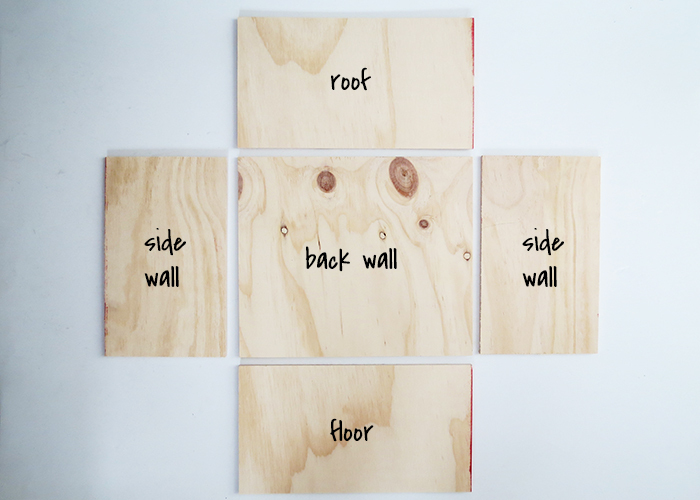 Start with the floor and the back wall, put some glue and nail. 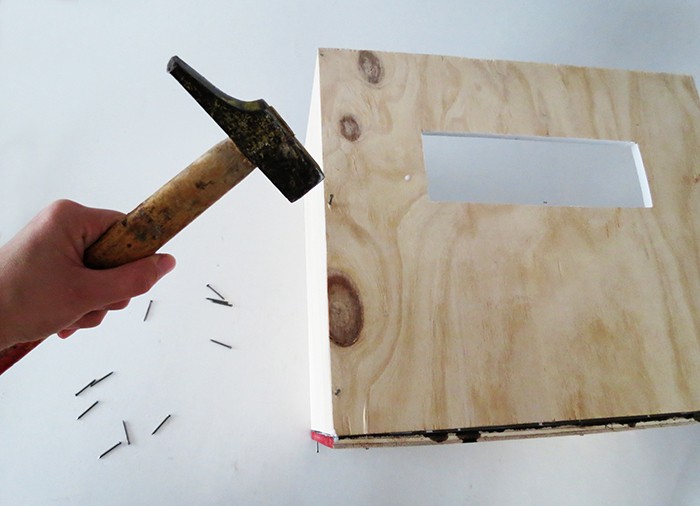 After a few fail nailing, I found out that it was much easier to drill a small hole first and then put the nail. Do what work best for you. Then glue and nail the sides, and finish with the roof. Tadaaaam the first room is done!! Repeat the same process to do more boxes. 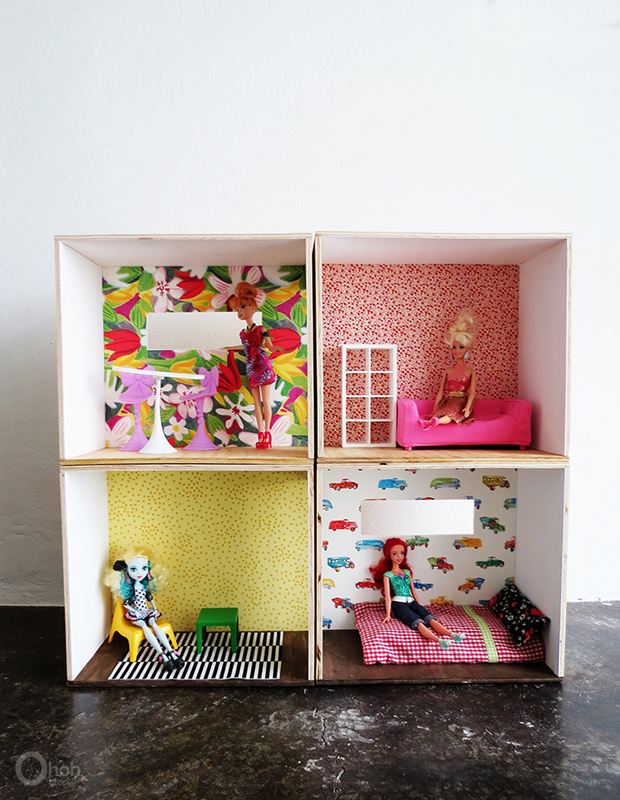 For now we have a four room dollhouse. We will think to some extension later. Kids can play with the boxes on the floor. But you can also put them on top of each other and construct different houses. 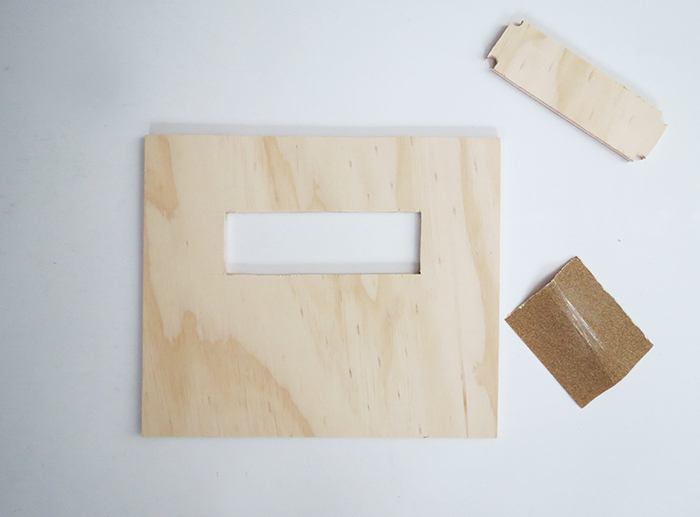 To prevent any accident, like a wooden box falling on a little toe, you can attach the boxes together with 2″ paper fasteners. They are easy to use and to remove when you want to change the boxes arrangement. If you have small kids you may want to remove the clips arms for more safety. 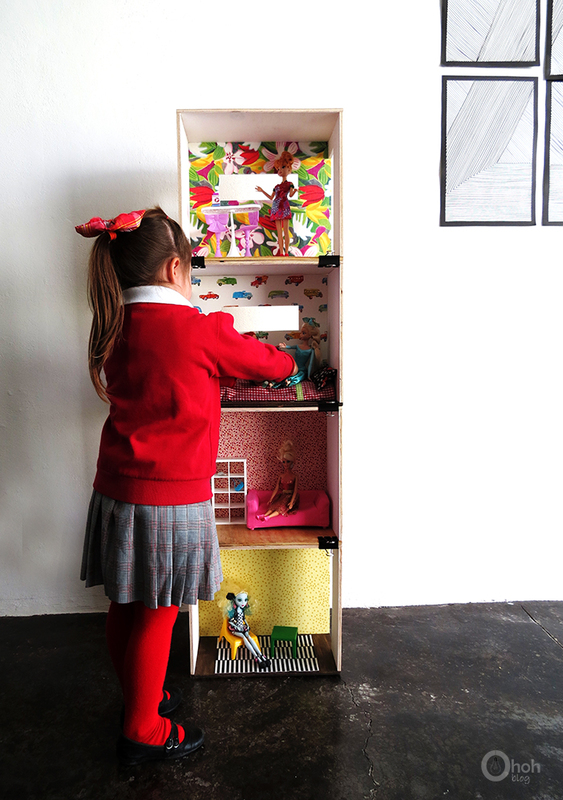 Older kids can have fun playing and moving the boxes by themselves. It was such a fun project to make. 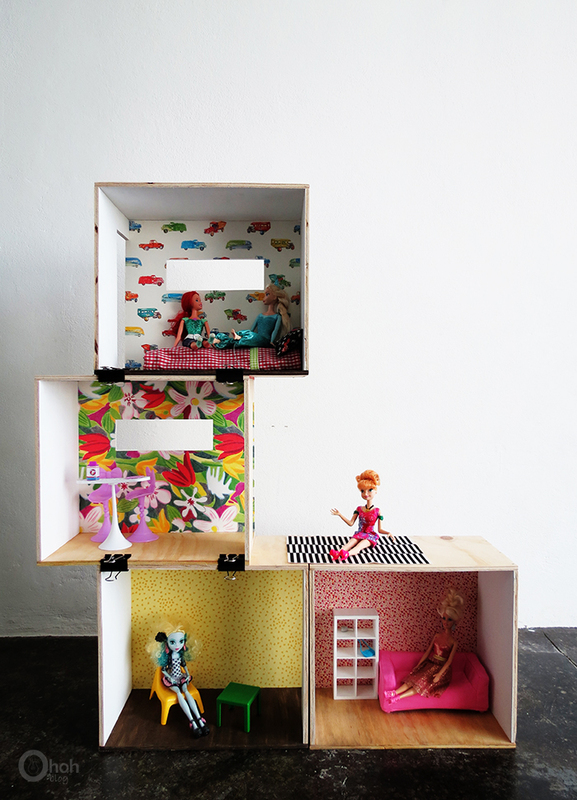 She plays all the afternoon with the dollhouse. 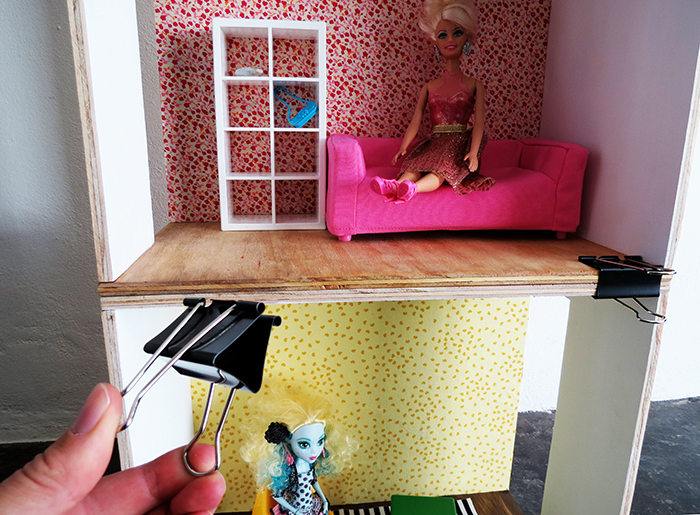 I already plan some dollhouse improvement, like extra furniture, a swimming pool and a garden. 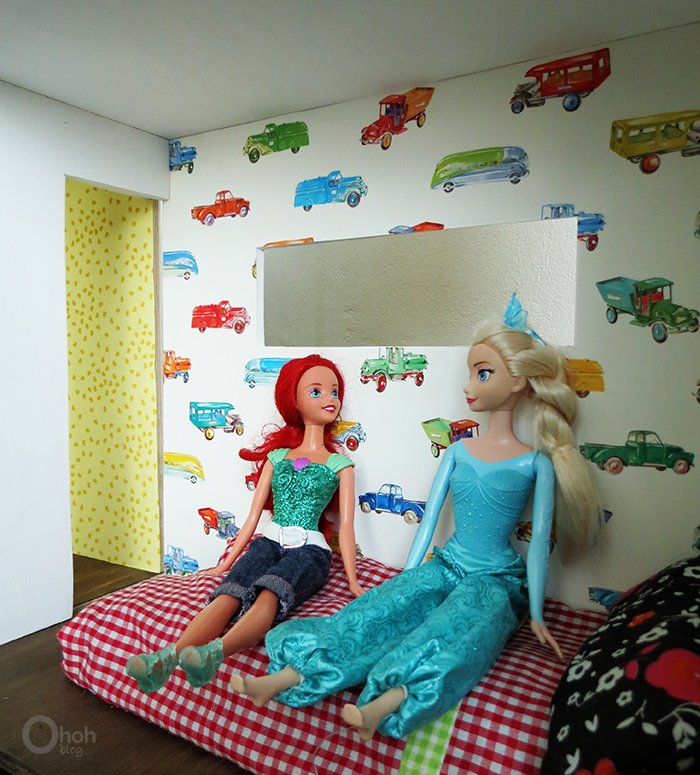 Finally I’m maybe the one who enjoy the most the new dollhouse…I promise I will share it with my kids! !